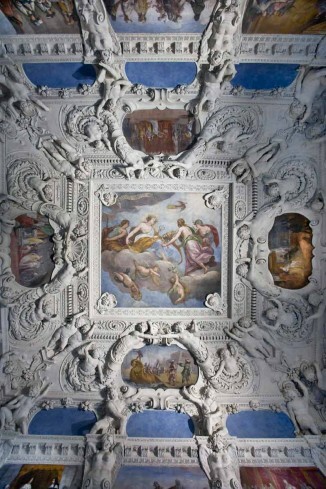 The stucco-work decoration of this room was carried out by Casella who was paid in 1648. 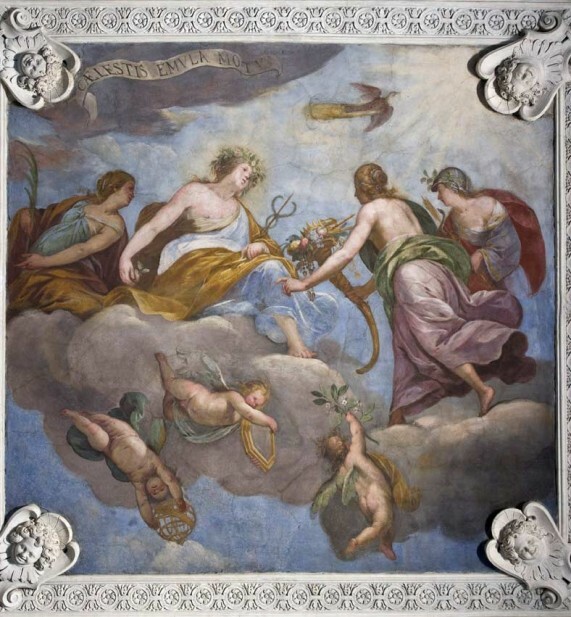 His style is recognisable due to the rich design of telamons (or imposing statues of virile men), putti, angels with plant-like tails, who, in close pairs show the way round the walls to the central painting on the ceiling. 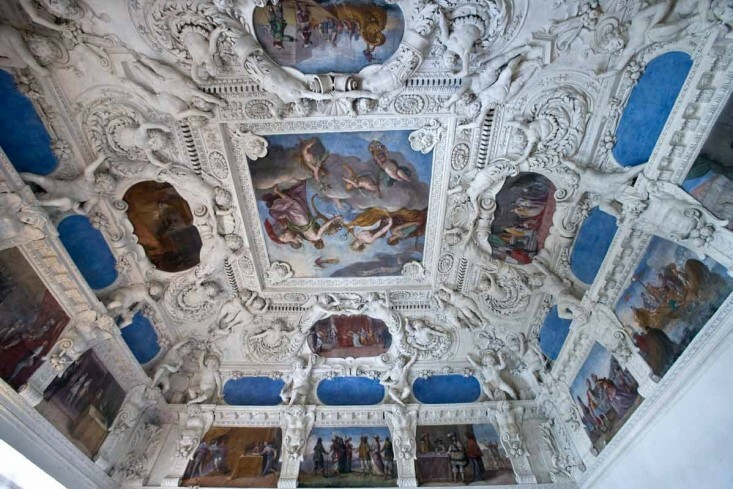 The stucco-work on the ceilings of this apartment is very similar to the workmanship on the doors. 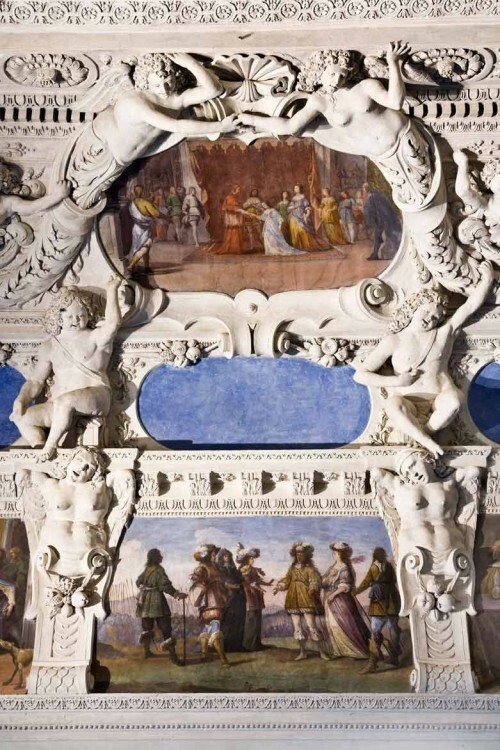 The sides of the doorframe are enriched with statuettes holding festoons of flowers and fruit, and above the door there is a border with vegetal-limbed putti on both sides of a frame which was probably designed to hold a portrait of a sovreign. 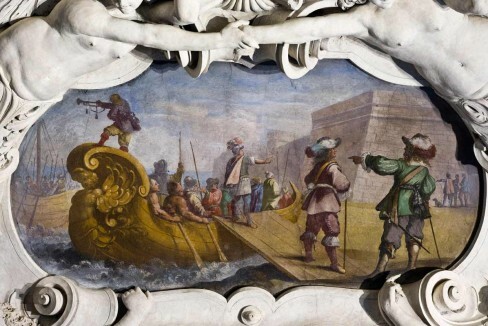 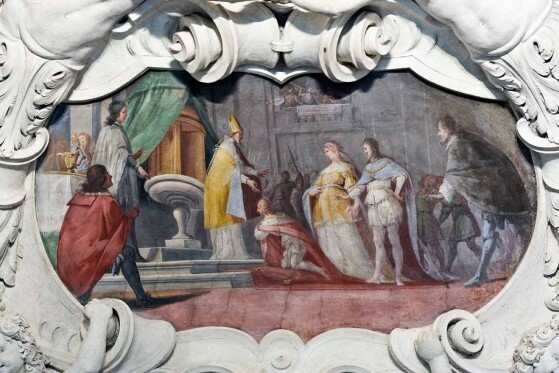 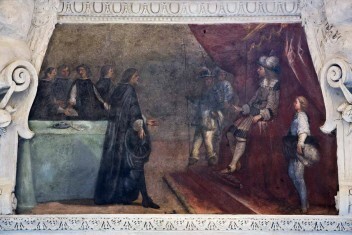 The fresco in the central panel of the room painted by Recchi is of Peace as the foundation for public happiness, and consists of a series of allegorical figures. 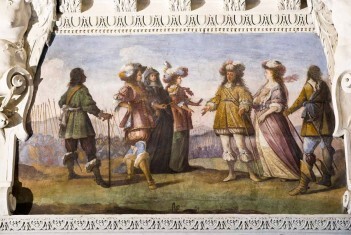 Peace, consolidate by well contrived alliances and treatises, including matrimonial ones, even dominates the picture underneath which feature the Savoy family’s relationship with the most prestigious European sovreigns, including the Kings and Queens of France, Spain and England and even oriental Sultans and the Emperor of Asburgh. 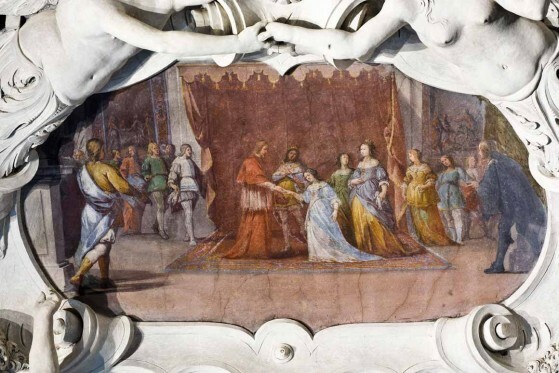 This multeplicity of relationships justifies the different styles of dress and scenery, but it has yet to be understood completely. 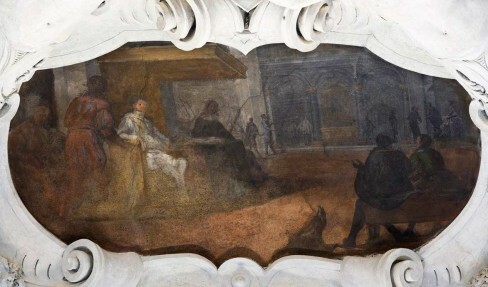 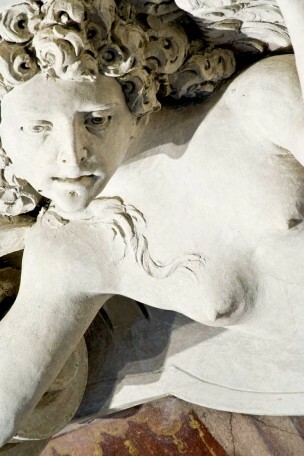 L’affresco del centro volta allude, attraverso una serie di figure allegoriche, al tema della Pace come fondamento della felicità pubblica. 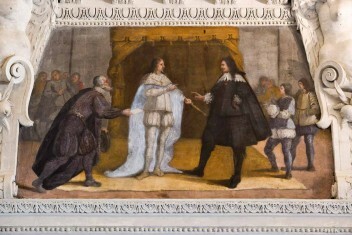 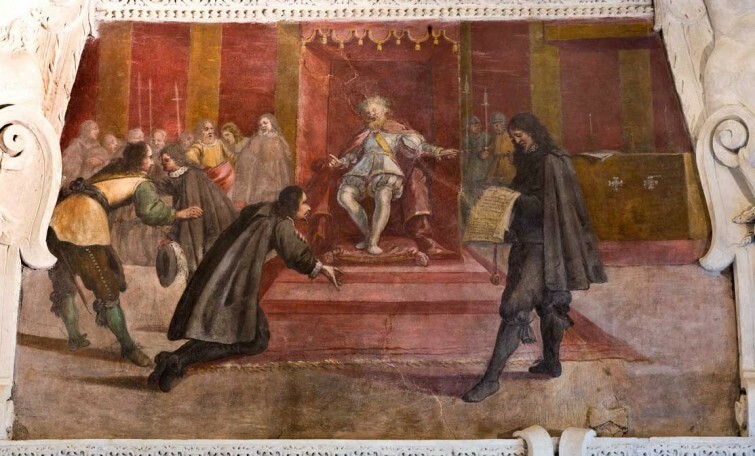 Particolare della fascia affrescata che raffigura i rappresentanti dello Stato sabaudo mentre stipulano trattati con i sovrani europei di maggiore prestigio, dal re di francia ai re di spagna e d’Inghilterra, sino all’imperatore asburgico e ai sultani orientali.